August 27 , by Mardi Robyn. 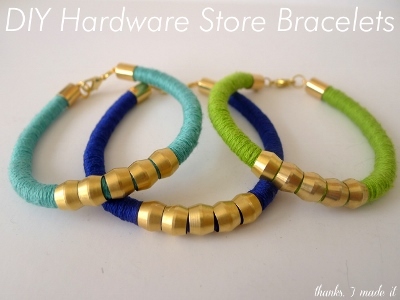 These bracelets are one of my favorites styles of hardware store themed bracelets I have seen. Look at how colorful and trendy they are! Erin from Thanks, I Made This came up with the design for these colorful bracelets. Brass compression sleeves are the feature of the bracelets. I am impressed! Read her tutorial and find out what other unique supplies Erin combined to make these fashionable DIY Hardware Store Bracelets. I love this post! Thank you so much!